My mistake with the portmanteau word Brexit brought me so many kind corrections that I feel a need to thank the readers who sent them and to apologize for making such a big gaffe. I got my information directly from the Oxford site, so there’s no excuse for such a mistake. Along with my carelessness, my vision was at fault. 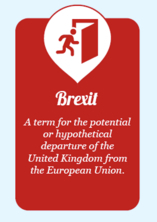 Never having seen Brexit written in ordinary type, I read the t as an l.
The post has been amended to explain that Brexit is a combination of British+exit. Another word in that post that drew emails from readers is fantods. One reader, having pointed out the Brexil/Brexit error, asked me to explain fantods. Fantods is a word I learned from reading The Adventures of Huckleberry Finn. Spelled fan-tods by Twain, it’s one of Huck’s words. It occurs in one of the funniest scenes in the book. There was some that they called crayons, which one of the daughters which was dead made her own self when she was only fifteen years old. They was different from any pictures I ever see before—blacker, mostly, than is common. One was a woman in a slim black dress, belted small under the armpits, with bulges like a cabbage in the middle of the sleeves, and a large black scoop-shovel bonnet with a black veil, and white slim ankles crossed about with black tape, and very wee black slippers, like a chisel, and she was leaning pensive on a tombstone on her right elbow, under a weeping willow, and her other hand hanging down her side holding a white handkerchief and a reticule, and underneath the picture it said “Shall I Never See Thee More Alas.” […] These was all nice pictures, I reckon, but I didn’t somehow seem to take to them, because if ever I was down a little they always give me the fan-tods. Everybody was sorry she died, because she had laid out a lot more of these pictures to do, and a body could see by what she had done what they had lost. But I reckoned that with her disposition she was having a better time in the graveyard. fantod noun: A crotchety way of acting; a fad. 1. usually fantods plural: a. a state of irritability, fidget, and tension; sometimes a state of acute worry and distress. b. a state of bodily or mental disorder especially when ill-defined and more or less chronic. 2. sometimes fantods plural a. an instance or occurrence of the fantods. b. a violent or irrational outburst. 3. a fidgety fussy officer of a ship. Edward Gorey’s trademark sense of impending doom is nowhere more darkly humorous than in this, his version of a tarot card deck. Appears that Gorey’s “fantod” owes something to the definition “a state of acute worry and distress.” Thanks for the comment.